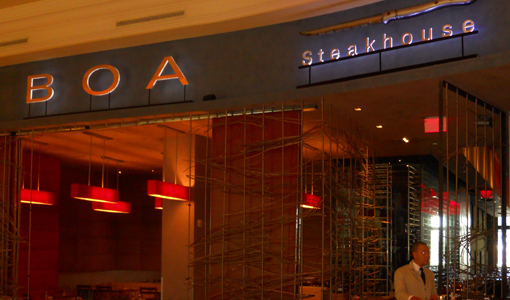 Located on the upper level of the Forum Shops inside Caesars Palace is Boa Steakhouse. With its extended hours and spectacular views of the Strip, Boa is a trendy hot spot for some great award winning American cuisine, especially if you are looking for some late night dining. The sleek d�cor includes deep amber colors mixed with wood and stainless steel textures that create a very warm and inviting atmosphere. The menu consist of a long list of meats including Kansas City filet mignon, free-range veal chops, bone-in rib eye and an aged 40-day New York strip that is too savory for words. There are other options besides just meat like the Australian lobster tail and a wide range of delicious side dishes. That said, most people come for the steaks and few leave disappointed.